If you are planning to retire from UC San Diego, be sure to go through the official retirement checklist for guidance on making your transition to retirement as smooth as possible. At the UCSD Retirement Association, opportunities abound for you to stay connected with the University. Through the Association you are welcome to participate in a variety of educational opportunities, events and activities that provide lots of fun and fellowship, and many meaningful opportunities to contribute your time, knowledge, skills and expertise as a UCSD Retirement Association Volunteer. You also enjoy the regular membership benefits of access to a UCSD Campus ID card, UCSD email account, and our very own Retirement Association Gazette full of information about Association events and opportunities. We hope you will actively partake of the many opportunities membership in the Retirement Association affords you. The community of UCSD retired staff and faculty is ever growing in number, in diversity, and in richness of its combined experience and interests. We welcome you to join in the fun and get involved. Members of the UCSD Retirement Association enjoy an enormous set of benefits including access to a UCSD Campus ID card, UCSD email forwarding, and discounts on travel and other opportunities. Learn more about the benefits of membership and how to apply for membership at the web page below. The UCSD Retirement Association's email forwarding service is available only to members. The service forwards emails from the member's ucsd.edu account to their personal email. Visit the page below to learn more about the Retirement Association's email forwarding service. See a sample of the Retirement Association Gazette (RAG), the UCSD Retirement Association's monthly newsletter. The Gazette informs Association members about upcoming events, activities, classes, and volunteer opportunities. The UCSD Retirement Association hosts hundreds of events each year. Through the UCSD Retirement Association, you are able to participate in educational opportunities, events and activities that provide lots of fun and fellowship, and volunteer opportunities to contribute your time, knowledge, and skills. UC San Diego has a team of benefits representatives to answer any of your benefits questions. These representatives team will serve as your first point of contact for beginning the retirement process. See the Blink page below to contact your benefits reps. Retiring is a complicated process. Thankfully, UC San Diego provides plenty of resources to walk you through the retirement process. If you are planning to retire from UC San Diego, be sure to learn about your retirement benefits for guidance on making your transition to retirement as smooth as possible. Through your generous donations, the UCSD Retirement Association Chancellor's Scholarship Fund gives financially needy students with strong academic credentials the opportunity to fully realize their potential. 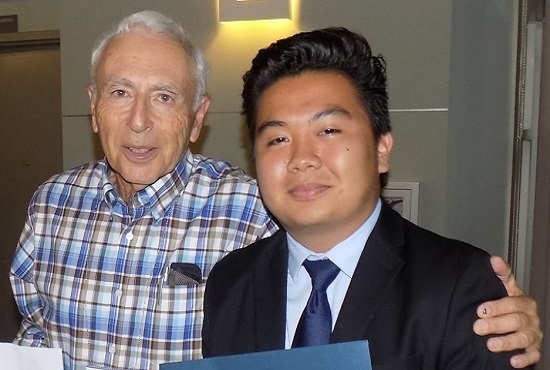 By contributing to our UCSD Retirement Association Chancellor’s Scholarship Fund, Association members have the opportunity to support and encourage these very promising undergraduates on their educational journey.